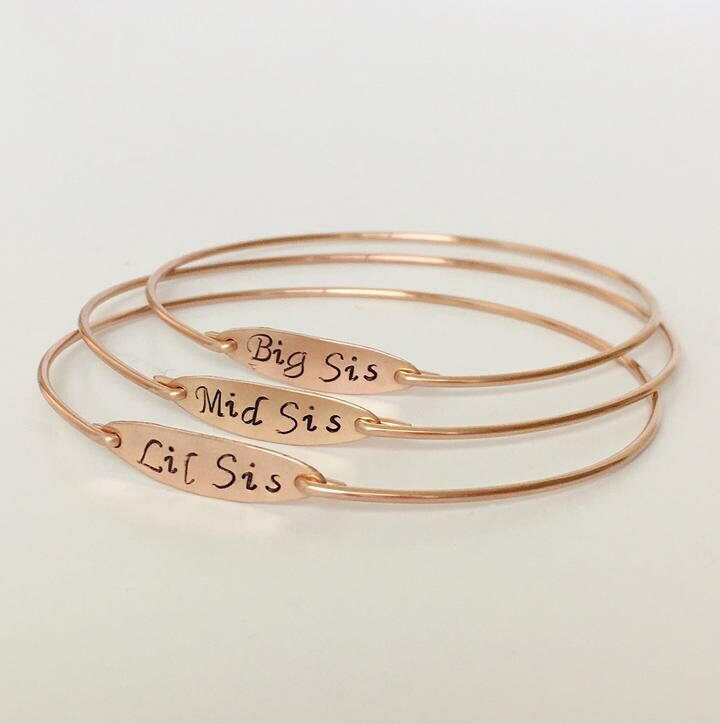 This set of 3 sister bracelets in a 14k rose gold filled finish makes a great wedding gift for sister maids of honor, sister bridesmaids, and gift for the sister bride. Other finishes are available from the drop down menu including 14k gold filled and sterling silver. Please mention your choices in the "Add a note to FrostedWillow" box at checkout. 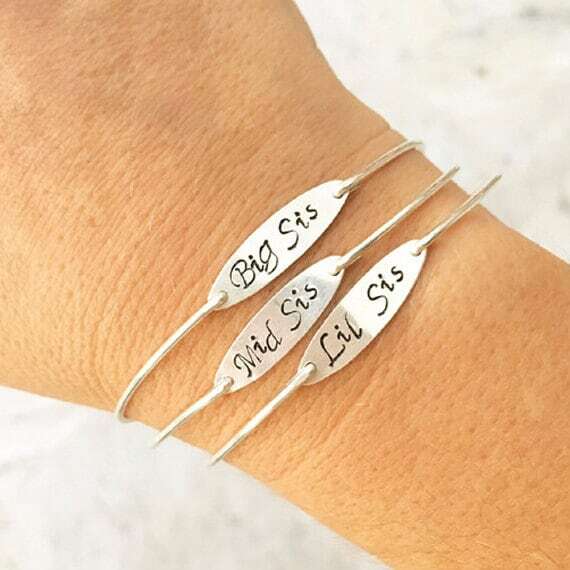 If you would like 3 sister jewelry set in a two tone finish. 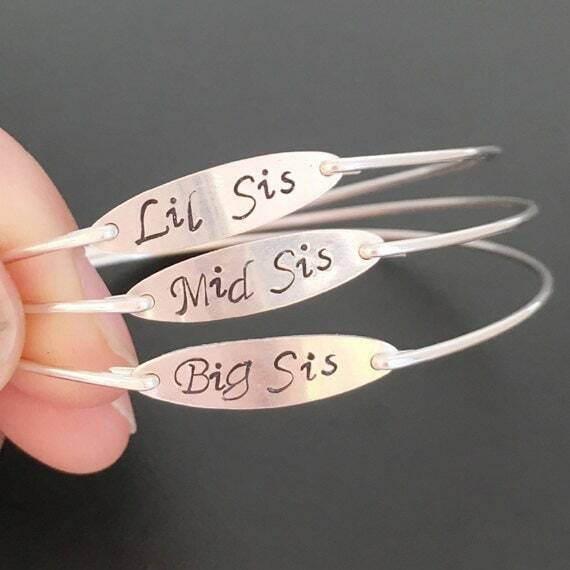 Simply mention your preference in notes to seller during checkout for your lil sister, mid sister, big sister bangle bracelet set. See main sizes below and descriptions of hand size. If you see a size & description that sounds like it's a good match, it's probably going to be a great fit. If you are caught between main sizes, see in-between sizes below in sizing tip #2. If still unable to pick between two main sizes, for example, you think the wearer might be Small 8 inch or Medium 8.5 inch... Ask yourself which of these two sizes is most likely correct? If your answer is the smaller of the two sizes (in this example small 8 inch), then go with the IN-BETWEEN SIZE of 8.25, just above the smaller of the two sizes you are considering, and it should fit great. However, if you think they are most likely the larger of the two main sizes you are considering (in this example medium 8.5 inch would be the larger of the two sizes), then go with the larger of the two main sizes, in this case Medium 8.5 inch, skipping over the in-between size, and it should fit great. 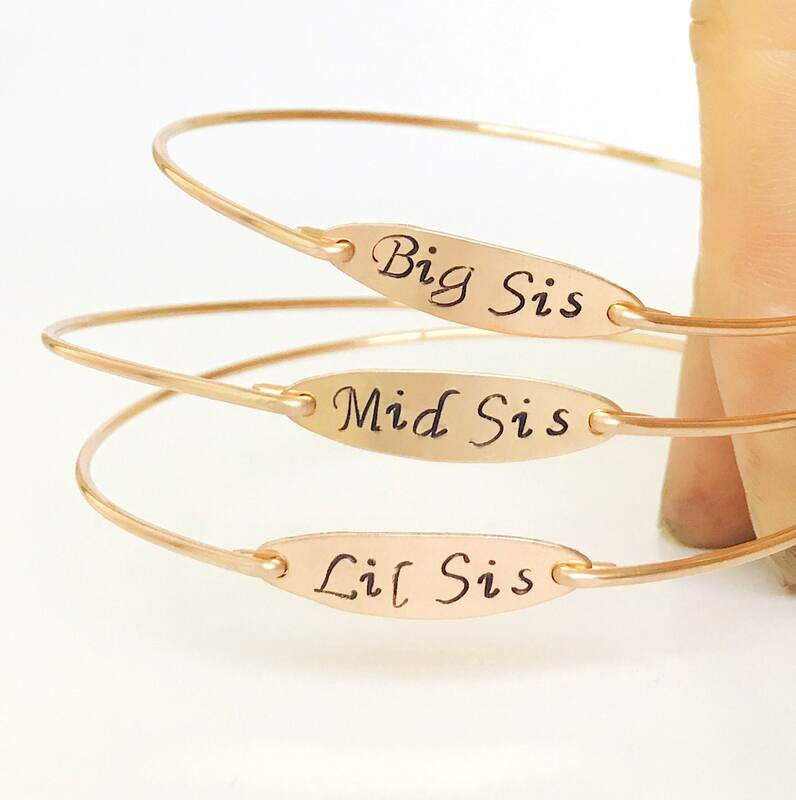 If the bracelet is needed for an event such as a wedding, and there would be no time to resize before the event, and you are unsure which size to pick, then select a "half size" above the size you are considering. For example, if you're considering Medium 8.5 inch, but unsure about the size, go up by a half size which is 1/4 inch (.25 inch) to the IN-BETWEEN size of 8.75 inch, and it should be fine. A half size (or 1/4 inch) above true size is still very close to true size, and will be fine. Another example, if you were debating the following two sizes, in-between extra small and small (7.75 inch), then go up by a half-size which is 1/4 inch (.25 inch) to small size of 8 inch, and it should be fine. It's better to be just a little above true size than just a little below true size for an event such as a wedding, if unable to measure for bridesmaids, maid of honor, mother of the bride or groom. A little above size can still be worn. If you are measuring, measure one of your favorite bangles or measure the circumference of the widest area of your hand where the bangle will slide over... To measure hold your hand narrow as if sliding a bangle on with your thumb tucked into palm of hand pointed toward pinkie. Measure circumference with a flexible tape, or with a piece of string going around the widest area of hand. All of my bangles are without a clasp for easy on & easy off. They cannot be made to open. I can always resize a bangle for you if it doesn't fit perfect. I don't charge any resizing fee. I want you to enjoy your bangles to their fullest. And come back for more!! This 14k rose gold filled sisters bangle bracelet set handcrafted with great care. All of my bangles including this sisters jewelry set are special creations that are original Frosted Willow designs. 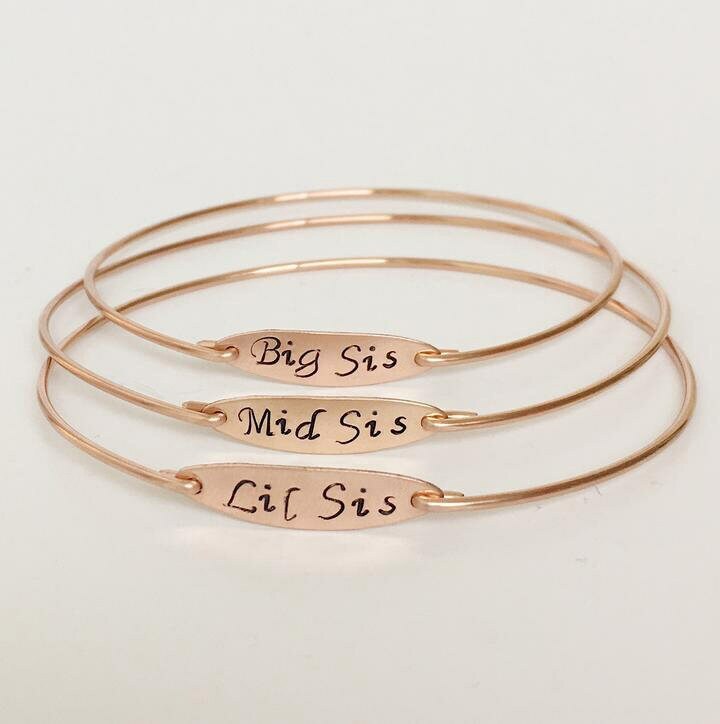 I hope you love your three sisters bracelets in 14k rose gold finish or other selected finish. A derivative of my Copyright © 2011 hand stamped bangle bracelet design.